Full-service engineering and building information model (BIM) development for a new 15,000 sq. ft. executive “green” tenant office expansion. The project, designed in accordance with the Cascadia Regional Green Building Council’s Living Building Challenge and LEED Platinum Certification standards, also includes an 8,000 sq. ft. greenhouse. The project was designed to meet Architecture 2030 goals and targeted net-zero energy use on an annual basis. Renewable energy features include natural ventilation, daylighting, passive solar heating, solar energy via photovoltaic panels, geothermal exchange, and solar thermal domestic hot water production. 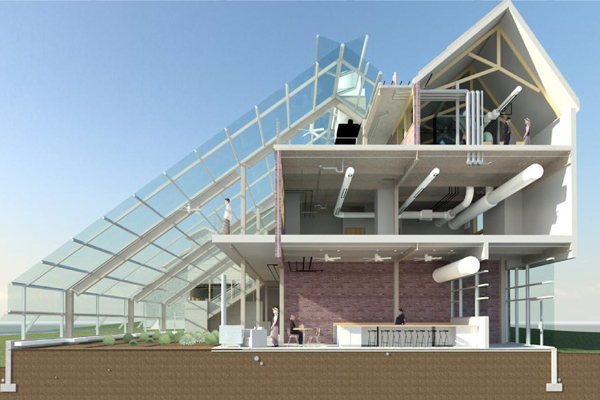 The geothermal system features earth tubes to decrease cooling and heating loads by pre-conditioning outdoor air, reducing cooling loads by 40%, and water-to-water heat pumps to generate hot and chilled water.